Aqua at Lakeshore East is a high-end 82-story mixed use development in downtown Chicago, and more specifically, the New Eastside. This newer construction condo building features 224 condo residences, 9 townhomes, 474 rental apartments and 300 hotel rooms. 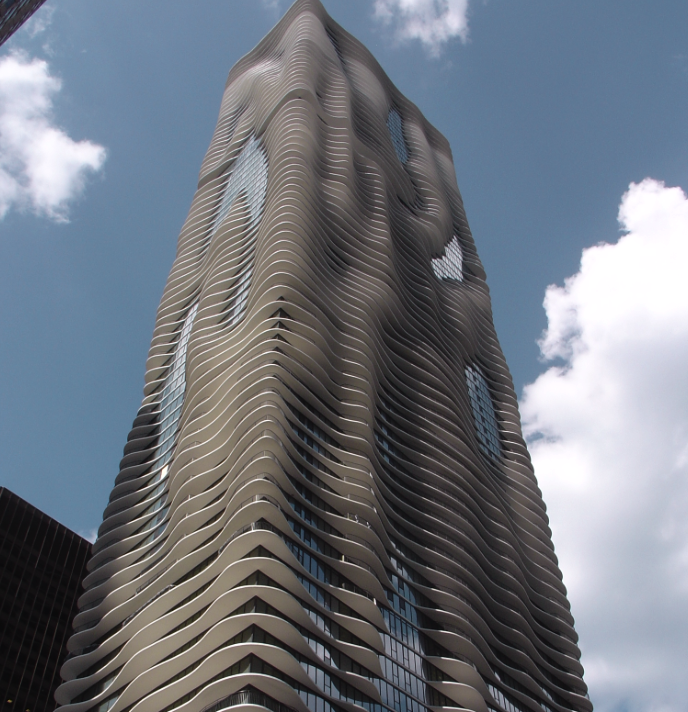 Designed by architect Jeanne Gang, the building has won architectural awards for its unique wavy design. The 224 condominiums are located between the 53rd floor and the 81st floor penthouse. Aqua condos feature floor to ceiling windows and a unique balcony design where no two balconies are the exact same size. See below for all condos and townhouses for sale at 225 North Columbus Drive, or check out Aqua's parkhomes for sale. Interested in condos for sale at Aqua? Call or text us today at (312) 953-0961 to schedule a private tour of the building and any of its available condo residences on the market! If you're looking for a high-end building with an optimal lakefront location, it doesn't get much better than the Aqua. The Shore Club at Aqua includes a spa, state of the art fitness center, a whirlpool, lap pool, steam room, sauna, billiard room, media room, and business center. At the top of the Chicago's Aqua is a large terrace garden, gazebos, two swimming pools, hot tubs, a walking and running track, and a fire pit. Aqua at Lakeshore East connects with downtown through a connection to two pedway systems as well. Condominiums for sale at Aqua range from studios to four-bedroom residences that boast hardwood floors, Italian cabinets, stainless steel appliances, granite countertops, high-end fixtures and marble bathrooms. Aqua condos offer a combination of private Shore Club entertainment and recreational facilities with both indoor and outdoor amenities. With its eye-catching design and ample amenities, Aqua townhomes, condos, and rentals are the perfect place for anyone who wants to have it all! Contact us to arrange a personal tour of Aqua in Chicago to experience the luxury! The reality is that Aqua condos for sale in Chicago change on a nearly daily basis; please reach out to a specialist to formulate a plan to not only find your dream Aqua condo but to able to seal the deal in what is one of the best communities in a very tight Chicago, Illinois, real estate market for condos and townhomes. Not seeing anything you like at Aqua Chicago in Lakeshore East? Start browsing more Lakeshore East condos for sale, or contact us today at (312) 953-0961 for help with your Chicago home or condo search!